Original Gel Cleanser is a mild, foaming face wash that gently removes make-up, excess oils and other impurities without stripping the natural oils from skin. It leaves skin skin feeling thoroughly cleansed and refreshed, with a more radiant appearance. Helps to maintain the natural acid balance of your skin. Contains mild ingredients that do not strip the natural oils from your skin, leaving it feeling gently cleansed and refreshed. After pre-cleansing apply the gel cleanser to damp skin, massage gently with your fingertips, remove with water and dry with a facial towel. 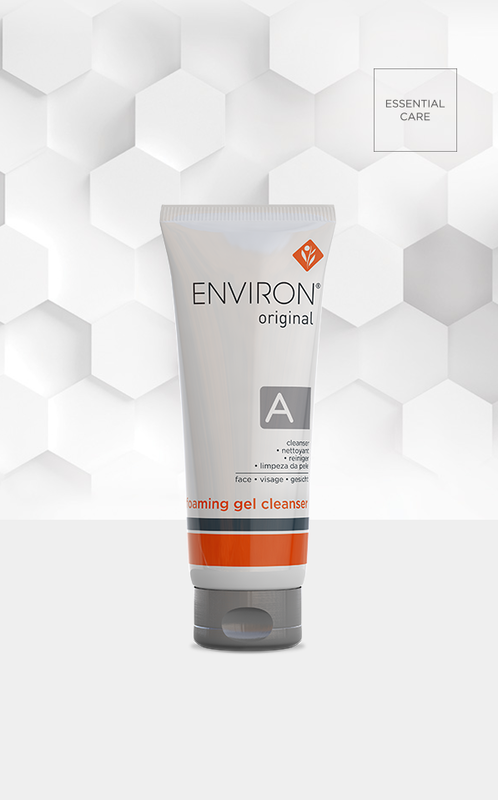 Tone and then apply your recommended Environ vitamin A moisturiser. Do not over-cleanse dry skin, especially during cold or dry climatic conditions. Reduce the frequency of use to once daily during these conditions.